Miraval Arizona has got it all, offering a wide range of activities, classes, retreats, and workshops, combined with an array of spa services, and of course, healthy seasonal and local spa cuisine. Executive Chef Chad Luethje (right) is dedicated to helping guests and residents live and feel better through eating, which means attempting to seek out the best and most healthful ingredients in order to highlight where the food comes from and how it fits into the season. 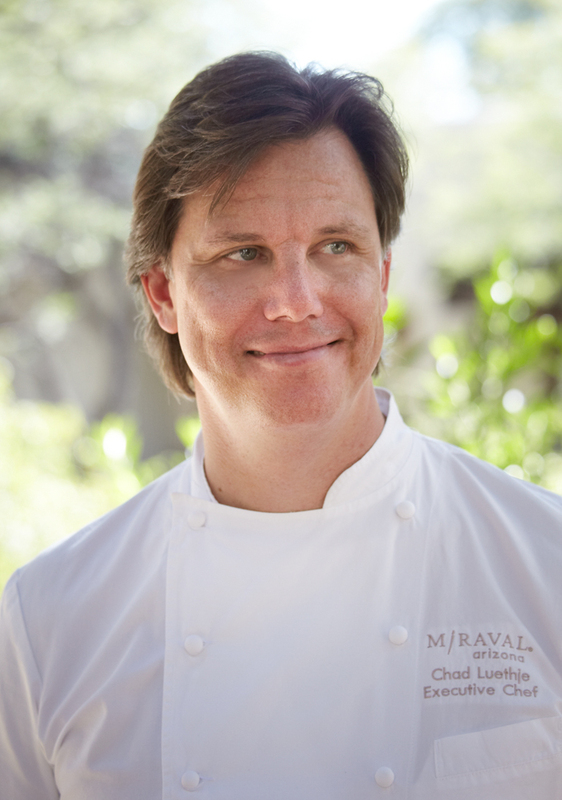 With more than 20 years of experience creating delicious, nourishing food in the kitchens of luxury resort and spas, Chef Luethje’s approach to cooking reflects Miraval’s commitment to full-flavored, fresh, healthy cuisine with local ingredients and non-traditional techniques to create familiar flavors and textures. Seasonality and localization are cornerstones of Miraval’s ingredients, and we love that they take the effort to source from companies and farmers that share those views. Stop by your local farmer’s market and pick up the bulk of the ingredients – like in-season spinach, fennel, and more – for these three deliciously healthy recipes. Give them a try this Wellness Week™! 1. Heat a sauté pan with a flameproof handle over medium heat and add the olive oil. 2. Add the vegetables and sauté until vegetables begin to soften, approximately 5 minutes. 3. Add the egg whites and season with salt and pepper. Cook until the bottom is done and the sides are firm, approximately 4 minutes. 4. Place the pan under the broiler for about 2 minutes to finish cooking the top of the omelet. Remove from heat. 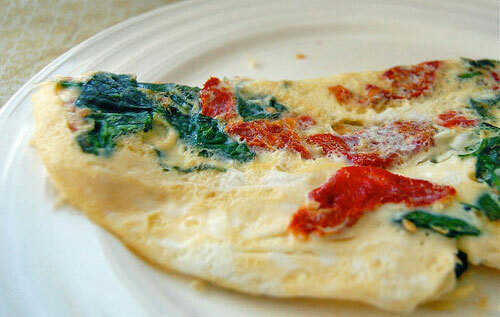 Spread cream cheese over the top, and fold over half the omelet and serve. Nutritional information per serving: 110 calories; 2.5g total fat; 1g saturated fat; 13g protein; 10g carbohydrates; 2g dietary fiber; 5mg cholesterol; 520mg sodium. 1. Place the focaccia on a cutting board. 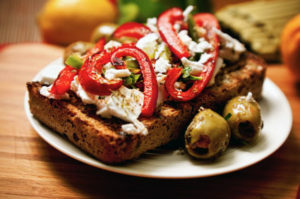 Spread one side of each focaccia half with the eggplant spread. 2. Lay the roasted red peppers, tomatoes, mushrooms, arugula, basil, and mozzarella. 3. Top with other piece of bread and cut in half on the diagonal. Nutritional information per serving without cheese: 160 calories; 4g total fat; 0.5g saturated fat; 5g protein; 26g carbohydrates; 4g dietary fiber; 0mg cholesterol; 680mg sodium. Nutritional information per serving with cheese: 320 calories; 16g total fat; 9g saturated fat; 28g carbohydrates; 4g dietary fiber; 45mg cholesterol; 780mg sodium. 1. Preheat oven to 450°F. Place the vegetables on a baking sheet and mix them with the olive oil. Season with the salt, pepper, and herbs. 2. Roast the vegetables for 10 minutes, or until lightly browned and moisture is noticeable. Remove the vegetables from the oven and transfer to a clean dish. 2. Heat a large oven-proof sauté pan over medium-high heat and lightly spray with olive oil. Add the halibut and sear for 1 minute. 3. Turn the halibut over and place in the oven and cook for 4 minutes or until fish is just cooked throughout. 4. Return pan to stovetop and add the vinaigrette (below) to simmer. 1. In a mixing bowl whisk together all the ingredients. Adjust seasonings with additional salt, pepper, and herbs if needed. 2. 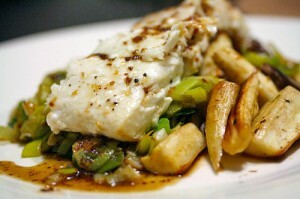 Arrange ½ cup of the roasted vegetables on each plate with 1 piece of halibut on top. Drizzle with 2 tablespoons of the warm vinaigrette. Nutritional information per serving: 220 calories; 4.5g total fat; 0.5g saturated fat; 26g protein; 20g carbohydrates; 6g dietary fiber; 35mg cholesterol; 760mg sodium.